Welcome! The members of the church would like to extend an invitation to you: come and worship the Living God with us. Come experience the love of Jesus Christ through our church family. Come find a place where you are known and loved for who you are. We recognize that each individual is on their own faith journey, and we respect and honor you as you come. The motto of the First Church is “Love Kindness” and we try to live that out every day. May the joy and grace Jesus promises be yours—today and every day. Weekly on Sunday at 10 am. 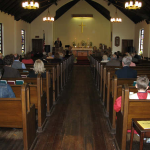 We believe God has given us our building to be a blessing, so the First Church is host to many Squantum groups and activities. If you are interested in renting one or more of our spaces, please call the Church Office at 618-328-6649, or email us. Our spaces are warm and inviting. Our Fellowship Hall downstairs has a stage, kitchen, and on street parking. 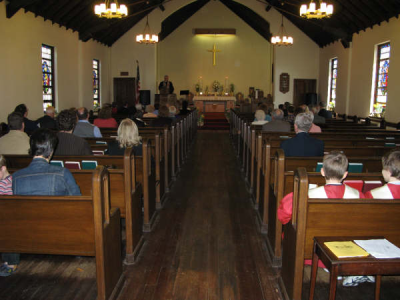 Our Sanctuary is perfect for a presentation or community meeting. Our parlor is a great place to entertain a group of 10–50, with a serving area for refreshments.